It was almost by accident that hubby and I became accustomed to flying with a little one so early on. 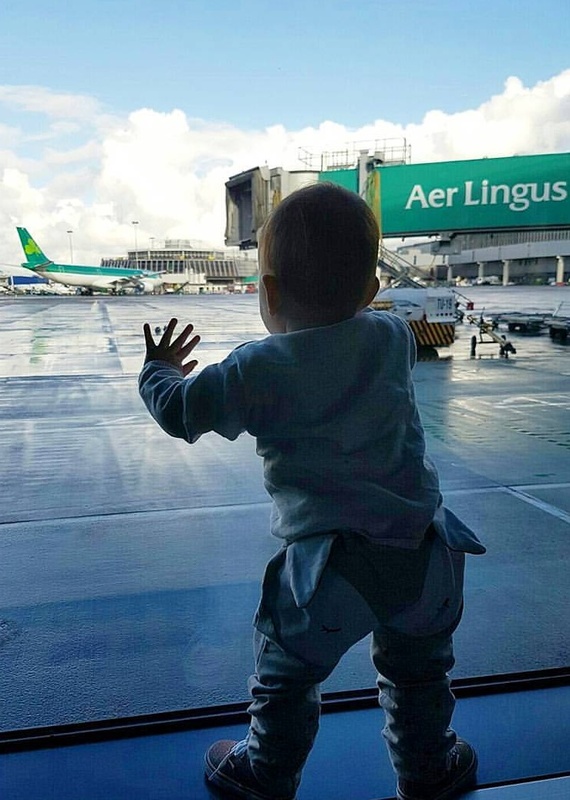 It certainly wasn’t in our plan of things to do when baby came along but by the time she was two weeks old we had booked our first flight for only three and a half months later, and not just any flight, a long-haul 9 hour stretch! You see, at that time my Father in Law was living and working in Abu Dhabi, a place we had fallen completely in love with over the years. Susanna’s Granddad only got to spend five precious days with her before having to fly half way across the world again; it was her fault really, she had kept us all waiting for ELEVEN days to make her grand entrance into the world. Of course as soon as the flights were booked the fear started to set in for me. I was a first time mum, gingerly navigating very early motherhood and I was feeding her myself which was not going all that smoothly so far but that’s another story for another time. 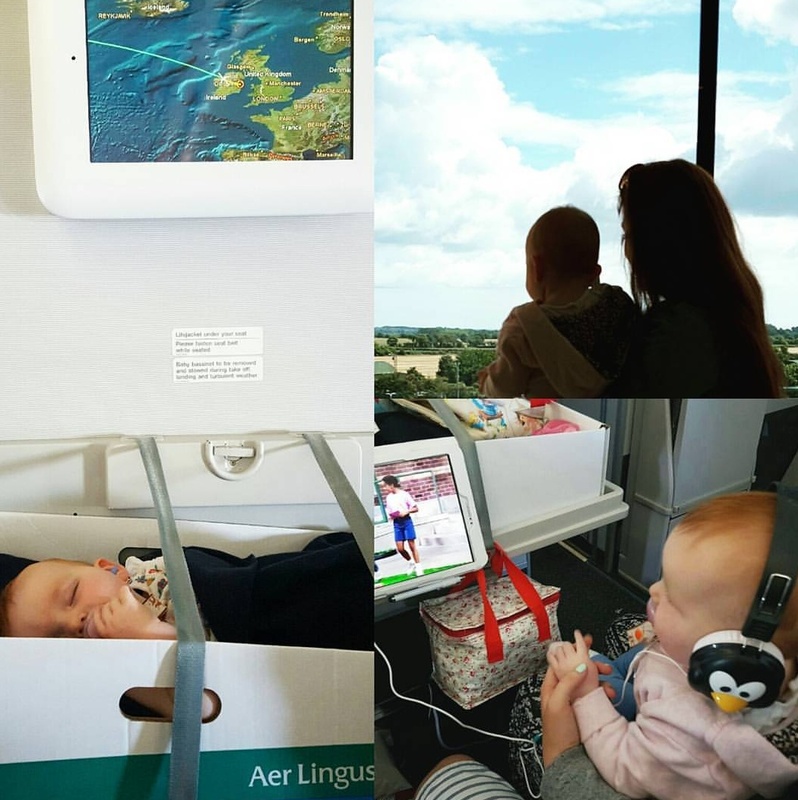 As the flight drew closer I began to get my game face on, I adopted a ‘we can only do our best’ attitude and off we set to the UAE on the day she turned four months. Don’t get me wrong, it was by no means a breeze, but you know what? We coped, we had to! 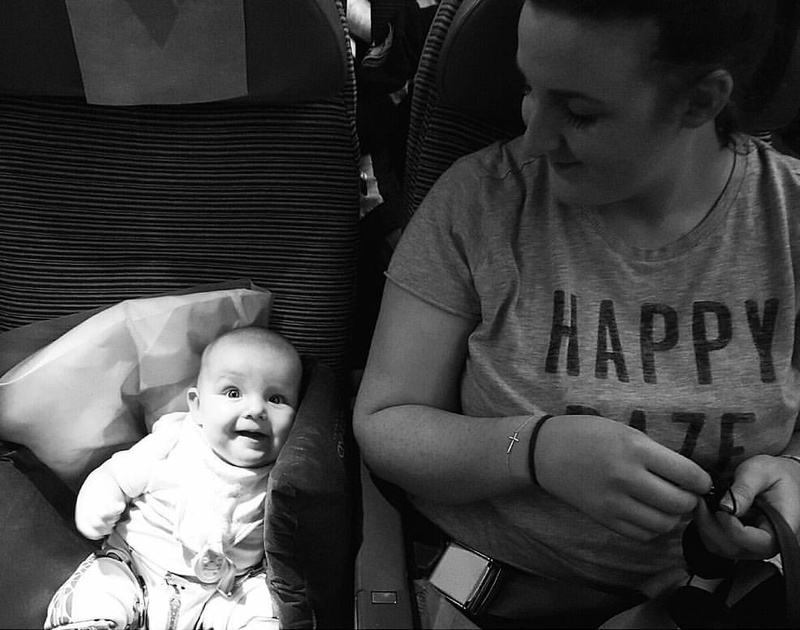 It was the best thing we could have ever done because not only did it take away the fear of flying with a tiny tot, it also gave us the bug for adventure with Susanna in tow. So 39,000 miles, four long–haul flights and two short hops to Europe later, we have picked up some tips and tricks which I have lost count of the amount of times I have been asked to share. 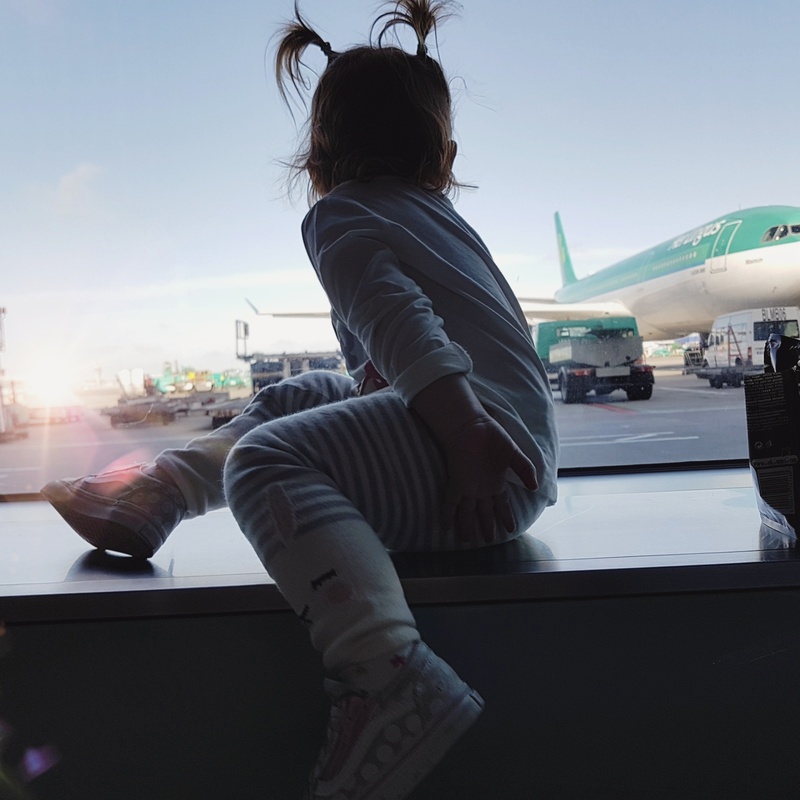 If you’re are flying long haul, call the airline as soon as possible to book a baby crib, these are usually available for all under 1’s but are limited to two or four cots per flight and so you really have to get in quickly. Not only does it allow you to lie your little one down for their naps but it also gives some valuable extra leg room which is amazing for letting them play on the floor in between snoozes. If you don’t manage to get a cot, why not ask for extra legroom anyway, it honestly does make the world of difference. Once your little one reaches the grand old age of two you will have to buy them their own seat, this is such a blessing at this age. Try to book either a window seat as the blind provides a good 30 mins entertainment but if you can’t, get a middle seat, plonking them in the middle of you and your partner also works a treat. Think small for your changing bag! I actually used a freebie from Boots as my travel changing bag as it was much smaller than my usual one. Having a separate bag only for nappies, wipes, cream & that all important outfit change in case of poo-namis is essential. It means that you are not carting a large bag full of other bits and pieces into the very tiny aeroplane toilets. Trust me; there is little enough room for you and your baby never mind a big bag too. The small bag will also easily slip under your seat without taking away from your leg room! When Susanna was very small we had the changing bag with the minimum essentials and a backpack full of ‘tricks’ to keep her entertained. This meant that I could have the rucksack on my back and the changing bag on the pram, leaving me hands free while we navigated the airports. 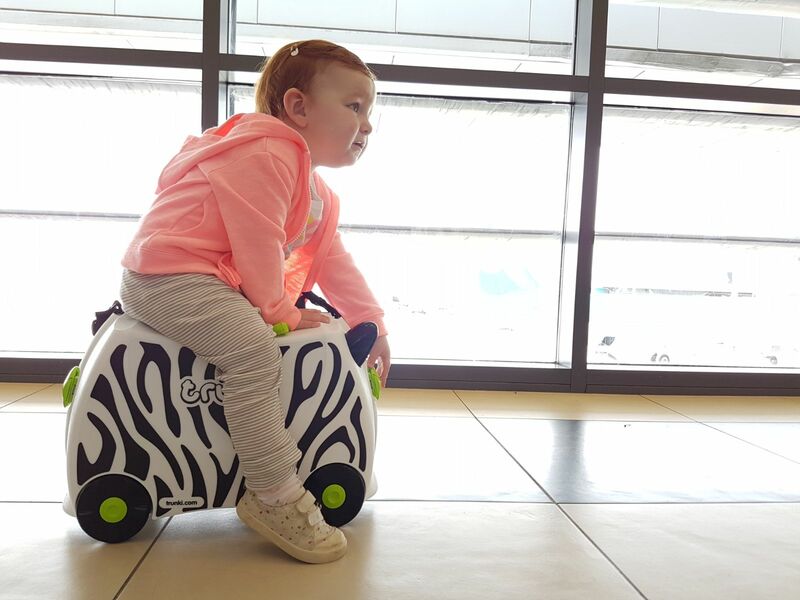 Another airport tip would be to let your little ones burn off as much energy as possible before the flight. When Susanna was small we packed two blankets in our hand luggage, one for lying on the floor of the airport and the aeroplane to allow her to roll around and kick her legs and the other for keeping her warm (flights can often be really chilly). As she got older and could crawl or walk we just sought out a fairly empty area and let her explore as much as she wanted. The bonus of doing this was that she often fell asleep during or just after take-off. Layers! Dress your little ones in layers so that you can strip them off if the flight is warm or keep them cosy if it’s chilly. Our first ever flight with Susanna was roasting and she spent most of it in just her vest! You do not want an overheated kid in a confined space, eeek! Also, dress them in the comfiest clothes they have. 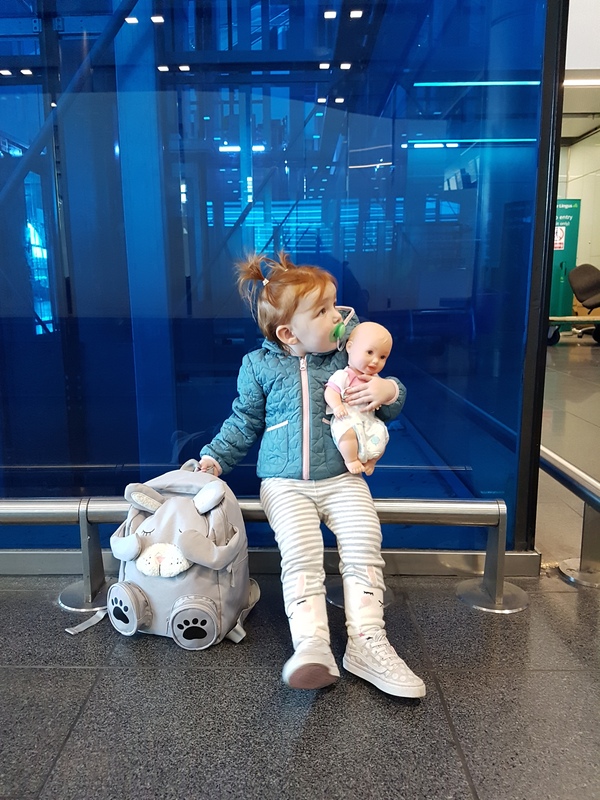 It can be so tempting to put your little one in a gorgeous outfit for the flight but trust me, having them comfortable will save you so much hassle. If you’re on a night flight, bring their pj’s, it will help them to realise it is bed time, even though they are not home. Buckle Buddy – this is, hands down, our best ever purchase for flights. We introduced it when Susanna was around 9 months and she loves it as much now as she did then. We keep it hidden away until moments when we think things are about to go downhill, he always saves the day! 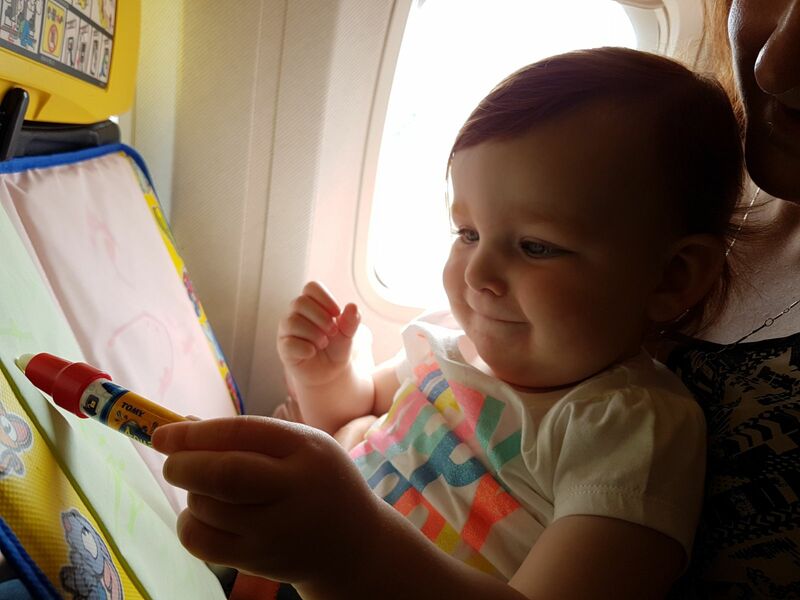 Aqua Doodle – our friends bought Susanna a large aqua doodle playmat for her birthday one year and she absolutely loves it so when planning for a long haul flight just after her first birthday I was determined to find something similar. I was over the moon to find this travel version and I think it is probably her most used item on flights. No mess, no fuss! Sticker Books – one of the things that we use as time fillers is a good old sticker book, Susanna loves the ones with large farmyard scenes for her to stick the animals in (generally inappropriate) places. This is such a cheap and cheerful way to help fill little snippets of time. Soft Blocks – I usually fill a ziplock bag with a variety of shapes and colours so that we can build towers, bridges, houses … you name it, we build it, on that tiny tray table. 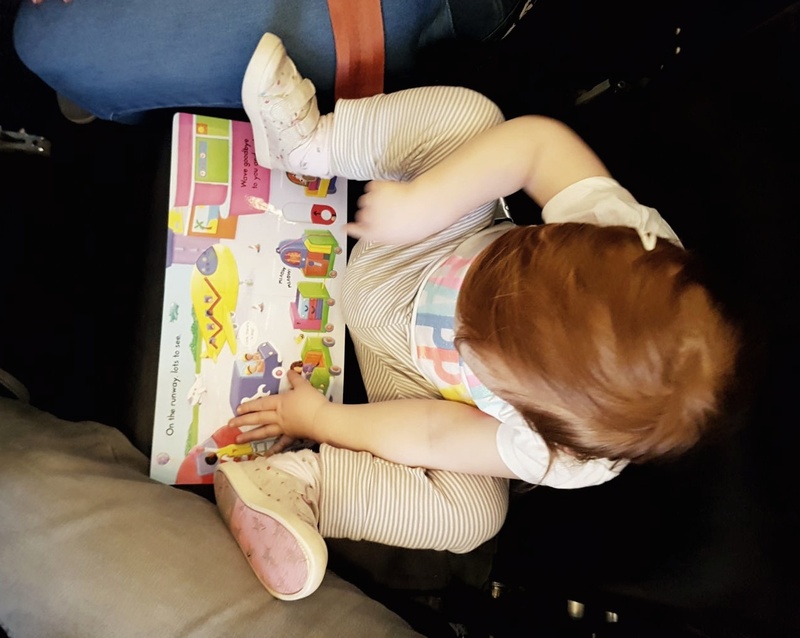 These are virtually weightless making them pretty much unnoticeable in your bag but a perfect way to keep little wrigglers in their seat a bit longer! Drench Bottle & Pom Poms – this was a bit of an experiment I came up with when Susanna was around 9 months old. She was going through a phase of loving playing with bottle caps so I found a bottle with a large cap (to prevent her putting it in her mouth) and filled it with multi-coloured pom poms. She spent at least half of the eleven hour flight playing with this make shift toy. Just remember to take extra pom poms for the flight home, most will get lost under your seat. Pop Up Books – I pack two brand new, light pop up books for every flight and one favourite book. I try to keep them for when she is getting sleepy as a little signal that its nap time. They have also been lifesavers when she is getting restless as a calming activity. Magnetic Cars – I picked up a magnetic police car and fire truck in poundland one day and these have become two absolute staples in our flight bag. The tray table acts as the perfect “road” and we generally get a good half hour play out of these…sometimes alongside the soft blocks which we use to build tracks and bridges for her to navigate. Never underestimate the power of a snack box! For our first flight Susanna was solely breastfed so that was easy (side note: wearing a scarf will act as the perfect, non-obtrusive, cover up during the flight if you like to have a little more privacy when feeding) but on each of the following flights she had started eating solids and so the snack box became one of the most important items in our bag. For babies, try to get them used to room temperature bottles or feeds too so that you don’t have to worry about heating milk. So what should you bring for little snackers? Well I would advise you to go for non-messy favourites and individually wrapped items to cut down on the hassle for you. Our go to snacks are raisins, yogurt covered fruit pieces, crackers, barny bears, quavers (just apologise to your neighbours for the smell), fruit yoyos and milky buttons for meltdown prevention. The great thing about milky buttons is that they are practically mess free, unlike milk chocolate…it’s a win win. Do not forget drinks! I took two bottles everywhere, one for water, one for milk, it cut down on the mad panic to attract attention from busy flight attendants and keep these bottles really handy when travelling through the airports as you will have to put them through security separately from your bags. 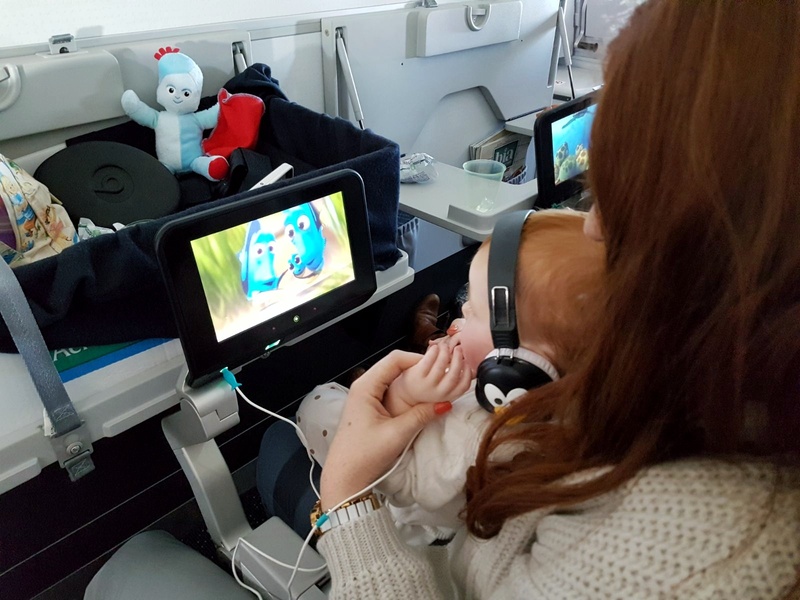 One thing that can make a flight extremely stressful for parents is your little ones suffering from sore ears during take-off or landing. When Susanna was small we put in earplugs to ease the pressure, however, as soon as she was old enough to take them out this totally stopped working. My best advice would be to give them calpol immediately before getting on the flight or as soon as you get on; of course the fact that it makes them sleepy is a bonus. Aside from the calpol, give them a feed or hand them a bottle as the plane begins to take off, hold off as long as you can before doing so as you want them to drink for the entirety of take-off if at all possible. Do the same again as you begin to land. So far these little tricks have meant Susanna has never had sore ears on the flight. A dummy really helps too. 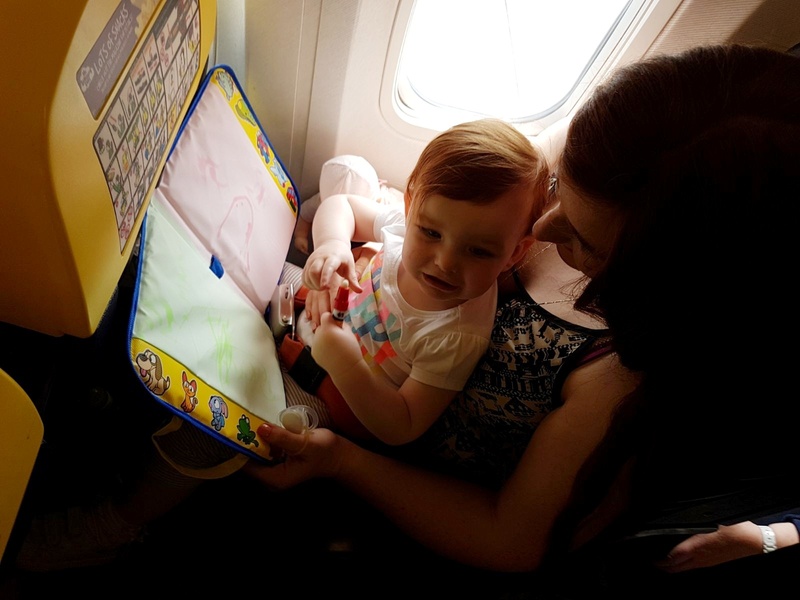 Our most difficult flight was when Susanna was around 16 months as she wanted to move around more than we could allow her and didn’t have the attention span for playing with toys or watching shows for very long. My best suggestion, if your little one is struggling, is to allow them to walk up and down the aisles in between food services and also find other little ones that they can interact with, even if only for 5 minutes. It helps to reset the cycle and avoid the dreaded meltdown. Rotate your activities; they don’t remember that you had already gone through the exact same process only half an hour before. Yes it can be tedious for you but it keeps them relatively content and that, to me, was the most important thing for a stress free flight. The most crucial thing, in my opinion, is not to allow yourself to get stressed. Babies cry, toddlers tantrum and kids can’t keep still, it’s a fact and there is nothing we can do about it so why let it stress you out? In every one of our flights bar our most recent one, Susanna had at least one difficult moment and once or twice a full blown meltdown, and even though it gave us red faces we found that people around us were so understanding, even taking time to congratulate us on how we handled the problem. By us keeping calm and not getting flustered we managed to limit the tough moments and calm Susanna down quickly too. I know there can be that one person who gives you a death stare as you soothe a screaming baby but you can only do your best and in all honesty, I think it’s more their problem If they can’t put in some earphones and drown it out! If all else fails, you’re not on the flight forever and you will most likely never see those people again, repeat that mantra if necessary! I’m sure I have forgotten some points but these are the main secrets and lessons from our 39,000 air miles. Preparation is honestly the key! I would say that the easiest time to fly is with small babies; they need very little in terms of entertainment and they mostly sleep. 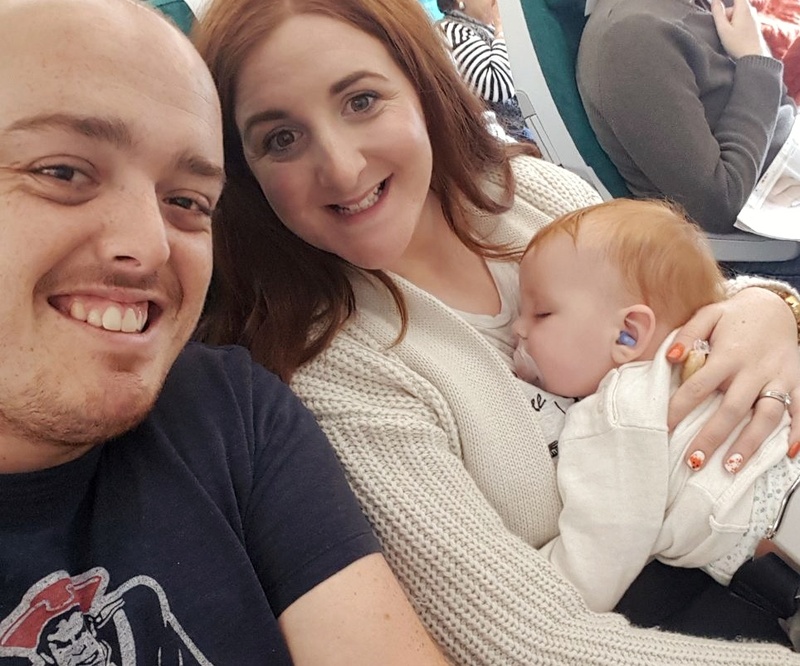 From experience, flying with our ‘just turned two year old’ was also far more manageable than any of the middle stages so rest assured, it just gets easier! As I said before, I am only touching the surface and because all little ones are so different there will never be a fool proof guide but I hope this helps give you even just one idea or helps to alleviate the pre-flight anxiety. Do you have any tips or tricks to share? I would love to hear from you. Next ›What have you got to be sad about? Great Read! Who do you find best to fly with? 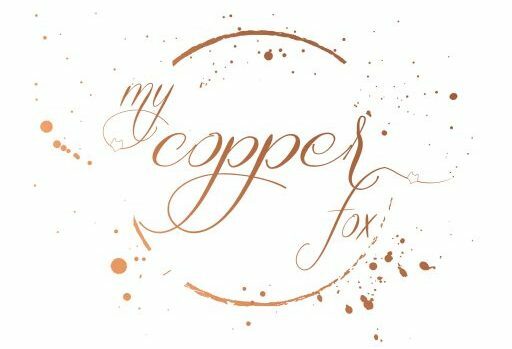 Have heard mixed review’s about a few?